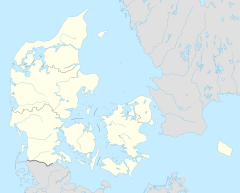 Lindholm station is a railway station serving the district of Lindholm in the city of Nørresundby, Denmark. The station is located on the Vendsyssel Line from Aalborg to Frederikshavn and is the northern terminus of the Aalborg Commuter Rail service. The train services are operated by DSB. The station opened in 2002 as a part of the new Aalborg Commuter Rail service. The station is located about 300 metres (980 ft) north of the old Nørresundby station which was closed in 1972. For a year 2012-2013, there was no train service, only bus service, since the Limfjorden Railway Bridge was damaged and unusable for trains due to a ship collision. The train services are operated by DSB. The station offers direct InterCity services to Copenhagen and Frederikshavn, regional train services to Aarhus and Frederikshavn as well as commuter train services to Skørping. This page was last edited on 20 September 2018, at 19:12 (UTC).